Guyana’s membership in the Organisation of Islamic Conference (OIC) since 1998 and participation in the Arab-South American Summit forum has draw this small English-speaking country closer to the Middle East at a crucial time when the world is facing a global recession. An emphasis on “economic diplomacy” propels Guyana “to open new frontiers for investment”, according to the Guyanese President, Bharrat Jagdeo. Recently the Guyanese leader visited Syria, Cyprus, Jordan and Libya. President Jagdeo made these visits at a time when the impact of the financial crisis are expanding and posing challenges to developing nations like Guyana. The possibility of returning home with something tangible would have been from the UAE, Kuwait or Qatar; however no cultural or economic agreements were signed. There was discussion of a double tax treaty with Kuwait in the pipes but the visit to Kuwait was also canceled. This would encourage increased trade and investment between the two countries, by removing double taxation. Both Qatar and Jordan promised to send delegations to Guyana to explore areas of cooperation and look into investments probabilities. In Libya, discussions centered on debt-forgiveness, investments and Libya’s assistance in social infrastructure projects in Guyana. The tour consolidated and deepened the friendly cooperation between Guyana and some Middle Eastern countries. It also boosted the friendship between the Arabs and the Guyanese people. 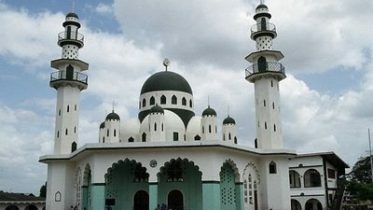 Guyana and Suriname with sizeable Muslim communities have historical ties to the Arab-Islamic World since the 1700’s when West African Slaves brought Islam to their shores. This relationship has been sustained and enrich by the Muslim communities in both parts of the world. Guyana and Suriname are both members of the OIC, and Islamic Education Scientific and Cultural Organisation (ISESCO). Suriname on the other hand, is a member of the Islamic Development Bank (IsDB). Guyana is considering joining the IsDB. Jagdeo found himself educating leaders in the Middle East about Guyana and CARICOM. Very little is known about CARICOM in the region as President Jagdeo discovered during his recent visits to Syria and Jordan. And Guyana is hoping to use its historical ties with the Middle East to foster closer cooperation between CARICOM and the Middle East. Libyan promised to open an embassy in Guyana and have lived up to its promise of sending a delegation to Guyana to continue discussion that started in Libya on debt cancellation, investments and the re-opening of the Libyan embassy. Thus, there are some movements on the Libyan front. Jagdeo visited Syria, his first stop on this tour of the region where he held bilateral talks with Syrian President Bashar al-Assad. The two leaders explored areas of cooperation in the fields of economic, culture and diplomacy. The visit was well covered by the Syrian media. The President’s visit made front page news. 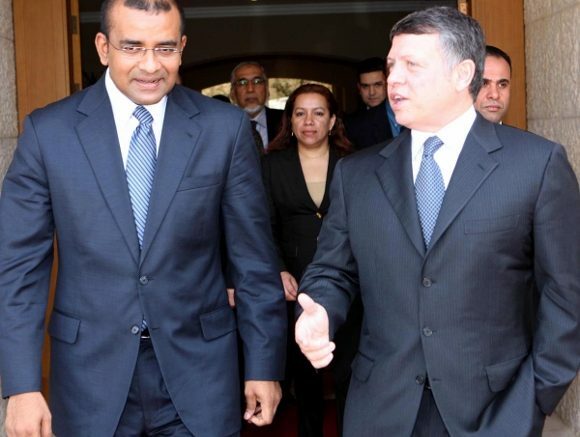 President Jagdeo became the first Guyanese head of state to visit Jordan where he met King Abdullah II and held bilateral talks on various issues. The Jordanian monarch promised to visit Guyana next year, when he visits South America. Jordan will also send a delegation to Guyana to build on talks that took place in Amman between the two heads of state. Jordan is playing a vital role in East-West dialogue among civilizations and praised Guyana for its harmonious religious diversity. Scholarships for Guyanese students to study in Jordan and fostering inter-faith and intra-faith dialogue between Jordan, Guyana and the east. These are well intended objectives but both parties need to do the leg-work to pursue them. Both Syria and Jordan are now more familiar with Guyana’s position on the Arab/Israeli conflict and noted Guyana strong support for a Palestinian homeland and Syria’s sovereignty over the Golan Heights, which is occupied by Tel Aviv. Oil and gas rich Qatar is of vital importance to the Caribbean. According to Ambassador Odeen, “their expertise can be utilized in the exploration for oil and gas in Guyana.” Qatar is one of the largest producers of natural gas in the world and has not been affected by the global recession. Qatar is exploring areas of economic cooperation with Guyana. The ruler of Qatar, Sheik Hamad Al Thani is keen to forge stronger economic ties with Guyana and Suriname. The Emir just doesn’t talk, he delivers. Guyana’s Ambassador to Venezuela, Dr. Odeen Ishmael says, “Qatar is also moving into the South American region to explore trading opportunities. “ Dr. Odeen added, “Guyana can take advantage of this: Qatar can be a useful market for Guyana´s hardwood furniture and semi-precious stones which are in great demand in the Arab world for the production of jewelry products.” Unfortunately but understandable given the circumstances, the President did not make it to Qatar. However the opportunity to address the Arab-South American Summit was lost. The objectives of consolidating ties and pursuing economic diplomacy had to be deferred for a more favourable day.. Trade between Latin America and the Arab-world increased from eight billion dollars to 20 billion in four years. Heads of states and delegations all South American states addressed the meeting but Guyana was silent, as Guyana’s Head of Delegation President Jagdeo had to return home. Qatar is also home of Al Jazeera, the Arabic and English news channel that has changed the Middle East and an alternative to CNN and the BBC. Guyana can use Al Jazeera which is expanding its services to South America to advertise itself on the international marketplace. Recently, Al-Jazeera has covered important news stories in both Guyana and Suriname. The problem in Guyana is the lack of human resources at the Ministry of Foreign Affairs. The Ministry lacks well staffed and trained personnel. Qualified diplomats, versed on Guyana-Middle East affairs have been marginalized. Another drawback is a lack of rigorous diplomacy and a presence in the Middle East to tap potential investments and capital. Guyana lacks a Middle East Desk in the Foreign Ministry and Middle Eastern countries have not seen the benefit of having a Guyana Desk. Guyana’s not actively participating at the OIC, ISESCO and the IsDB is not helpful in attempting to raise its stature in the Middle East. However, Guyana’s President Bharrat recently indicated that this will change. Guyana is looking to bolster ties with the Middle East and to establish a diplomatic presence in the region. And President Jagdeo’s recent disclosure that he will visit Dubai, Qatar and Kuwait to continue his mission to the Middle East to seek investments for Guyana indicate a serious effort to look East. Be the first to comment on "Analysis of Guyana’s President B. Jagdeo Mid-East Visits"